I am aware there is such a thing as narrative poetry, and I am not a fan of the narrative poetry form. However, who am I to say what a poetry form is? For example, what form defines a sonnet? Some 20th century sonnets are one letter per line so one word is spelled vertically. You know when you see it that the poem is a sonnet. Traditionalists will argue a sonnet must be iambic pentameter with exactly 14 lines ending with a heroic couplet. My “experimental” sonnets are not iambic but they do have 14 lines. Elizabeth Bishop’s posthumous published “Sonnet” (1979) is a reverse sonnet and is gorgeous. Back to narrative poetry, an essay can become a poem, maybe, while a poem can be an essay. Possibly the intended purpose of the poem or essay should dictate how it is pigeon-holed by its reader. But more often than not it is the form of the poem on the page that determines how it is perceived by the reader. Letters, To The Men I Have Loved (2014) is a combination of letter/essays and poems written by Castro Mármol about and directed towards male family members and her former lovers. She admires and frets over her male relatives. She is very open with what happened between her and her lovers, and how that particular relationship ended messily. I have no idea how anyone can be that open about their relationships even when I, an absolute stranger, have no idea who these men are. I am originally from a small US Midwestern town where it is important to have everything about your life be private. There is a sharp divide between your public life and your private life. It is not about keeping secrets, but what happens between you and another person is not to be shared. So, reading about the relationships between Castro Mármol and her lovers was at first awkward. I can understand how this would be cathartic exercise and the artistic result is good. You don’t know anything about anything until you write about it. Some poets that I know would call the letter/essays poems in themselves, but I am not comfortable with that classification. The letter/essays convey something more than the poems. The letter/essays are better than the poems. The poetry is the cathartic getting-over-the-relationship type that is universal among all humans even when they do not write poetry. The difference between the angst-wrung poetry most people write and throw in the trashcan and what Castro Mármol wrote is Castro Mármol’s poems are good. Some are breathtaking. If you have experienced a messy breakup, then you will empathize with her sentiments. What I admire most about this collection is Castro Mármol writes as a woman and exclusively with a woman’s voice. The vast majority of Western women fiction, poets, and (especially) nonfiction writers write with a male slant even when the “voice” or “character” of the piece is female. I would argue it is an unconscious habit learned from equally unaware teachers. Historically a woman had to write, or imitate a “male” voice if she wanted a passing grade, to obtain a graduate degree, or to have her writing published. In A Room of One’s Own (1929) by Virginia Woolf, Woolf discusses the necessity of a woman writing as a woman to be a complete human being and how, at the time she gave the lecture to a group of British, upper to middle class, women university students in 1928, writing as a woman was a precarious activity. Finding this collection by a woman poet writing as a woman on a national chain bookstore shelf as a new book makes me feel better about the world. I look forward to seeing what Castro Mármol does next. Letters, To Men I Have Loved (ISBN: 978-1-4787-3590-8) can be found at bookstores, online through your favorite bookseller, and at your friendly public library. It was illustrated by Deanna First. Castro Mármol’s website can be found at http://mirthamichelle.com/ . The publisher Outskirts Press (http://www.outskirtspress.com) is a self-publishing company. The poetry and letter/essay collection can be ordered online at http://outskirtspress.com/mirthamichelle/ . Good girls didn’t romp about on Blackberry Night. Father has strong opinions about it. His biggest, fattest sermon of the year is all about Blackberry Night, which is also Michaelmas, when is also when Archangel hurled the Devil from Heaven. Naturally, this annoyed the Devil considerably, and goes about on that night spoiling the blackberries. ‘I’ll protect you,’ said Cecil, laying his hand over mine. This is the legend as I understand it. At the end of the battle of who would rule Heaven, Archangel Michael pushed the then-angel Lucifer one final time and Lucifer fell all the way to Earth and landed in a bramble patch. The bramble patch was full of thorns and blackberries. Lucifer, already furious at losing his access to Heaven and God, thrashed his way out of the brambles, cursing the thorny vines and staining berries as he went. So, no one is to pick blackberries after Michaelmas, because the Devil cursed them. This victory by Archangel Michael and his band of angels is one of the events celebrated at Michaelmas, a traditional Roman Catholic Church holiday adapted by the British Isle Anglican Church. When Michaelmas is to occur seems to depend on who you are talking to or reading. Some would have it be September 29, the traditional “quarter day” when rents were due. Others would have you wait until October 10 or 11. I understand a more modern celebration of Michaelmas has been pushed up to the Autumn Equinox, September 21. Michaelmas was in some sense a traditional second harvest festival, or a thanksgiving celebration. The harvests were all in, whatever was required had been sold to pay the rent, and the first frost historically could be expected any day towards the end of September. Blackberries would have been in abundance, and hard to preserve outside of jellies or jams, so they would need to be used as picked. Stories about the food served at any holiday can define a culture, so blackberry dishes and associated stories around Michaelmas would help define the local traditions and culture. 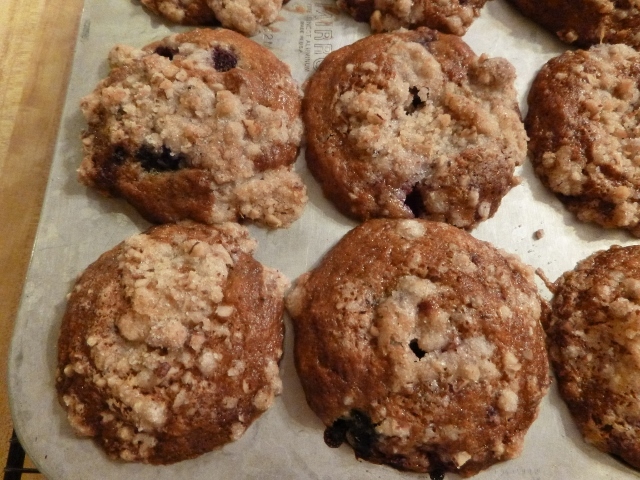 Blackberry muffins are tasty year round thanks to freezers. 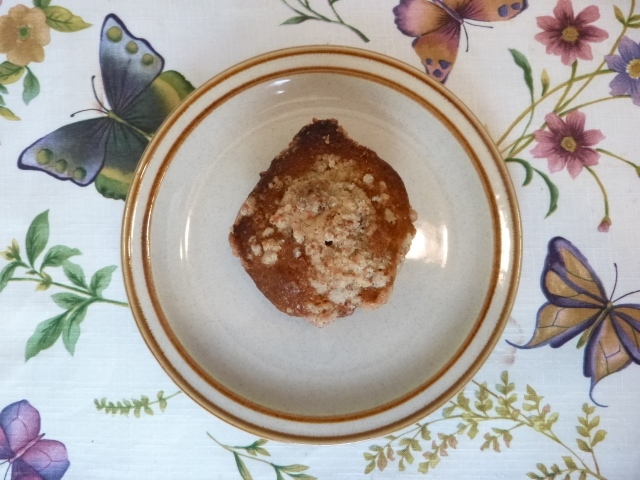 I was reading about Michaelmas, a much mentioned calendar date in Regency and historical romance novels – Mr. Bingley of Austin’s Pride and Prejudice was to decide to keep or release his lease of Netherfield Park by Michalemas – and thought blackberry muffins sounded good. I went to my trusty cookbooks and did not find a recipe. So I went online and found a promising looking recipe on the Williams-Sonoma website. I have seen Williams-Sonoma ceramic mixing bowls, usually chipped, in junk stores. What told me this was the recipe to use was it was designed by Beth Hensperger for the Williams-Sonoma Collection Series, Muffins (2003). I do not think Hensperger has ever developed a bad muffin recipe. I used a frozen three-berry mix of blackberries, blueberries, and red raspberries. This worked fine. Following the recipe was simple. The recipe called for maintaining the structure of the berries. The berries only need to be stirred three times after adding to the batter. This keeps the white quick bread white. I prefer to mash part of the berries up and swirl within the batter. When I make this recipe again I will mash all the berries so there are no empty spaces within the muffin where the berry has cooked then collapsed. Mashing the berries is my preference for an everyday muffin. Keeping the berries whole looks pretty and would work for a holiday brunch or breakfast. I like the pecan crumb top to the muffins. The crumb topping adds sweetness and finger-licking goodness to your breakfast. Even though the muffins do not need the crumb topping, I encourage you to keep it. 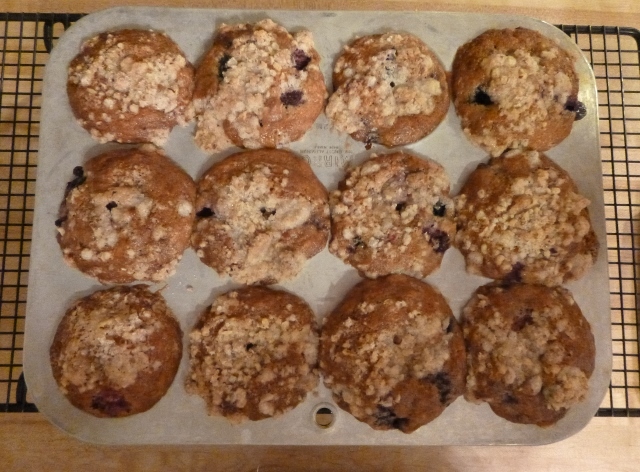 A close up of the topping on four berry muffins still in the pan. Another reason to incorporate mashed berries into the batter is it keeps the muffins from sticking to a well-greased and floured muffin tin. I was not expecting the problem of removing the muffins from the pans. 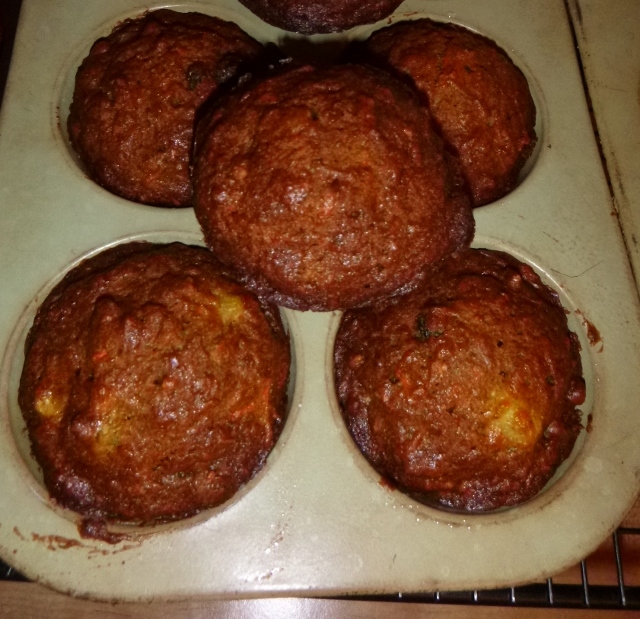 I had to leave the muffins in pan until the next morning after the muffin pan spent the night in the refrigerator. I dislike using paper cups because I just do. For this recipe I would recommend silicon muffin baking dishes or decorative muffin paper cups, if you have them. The biggest problem was the muffins sticking to the pan. The recipe said it made twelve muffins. 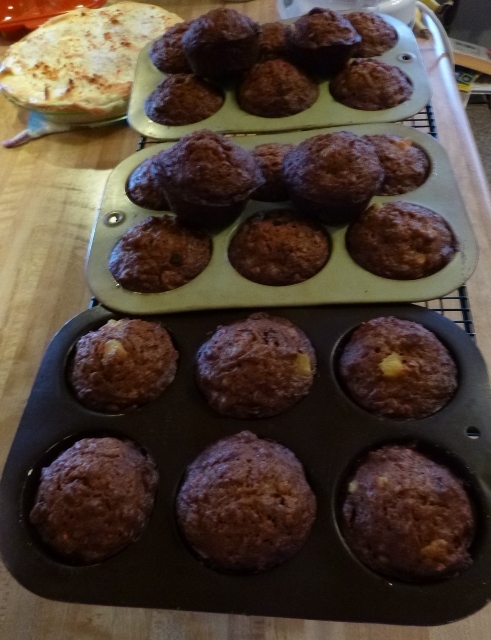 Here are all the muffins still in the pan they did not want to leave. I will be making this recipe again. I will be using the crumb topping in recipes that do not call for it. This is a fun recipe to make for family because the finished muffin is pretty as well as tasty. Chime by Franny Billingsley was a finalist for a National Book Award for Young People’s Literature (US) in 2011. It is a beautifully written, if slow at times, “growing up” story. The protagonist “came of age” before the book started, I think. I cannot tell you the “coming of age” backstory without spoiling the a gorgeously written book. In the first scene she is presented at the train station by her village pastor father as a child, but she does not have a child’s “voice”. By the end of the story she has grown into that adult voice we met in the first chapter. Check Chime out from your favorite public library, or purchase it from a local bookstore, or from your favorite online retailor. In Addition: Besides the story of the Devil falling into the bramble, stories also include Pan and other satyrs fouling the berry vines after Michaelmas. “She of the Dreaming Sky” (2005) took time to assimilate. Randall describes her poetry as “spiritual poetry” and that is true. The challenge when reading “spiritual poetry” is not to be intimidated or put off by the intimacy expressed by the poet. A spiritual expression, in my mind, is an effort to get at as direct as possible the point of entry where the artist makes first contact with the word, music, image, motion, or other creative endeavor without judgement as it enters his or her conscious awareness. Anyone who can do this well for an entire poetry collection is to be commended. Western European art and poetry often desire to use the entire planet’s cultural treasure chest in its creative expression. Randall uses the entire North American cultural palette with a deft hand. Some individuals may find reflections of their own insecurities in her poetry, and criticize her for that perceived appropriation. My response to such complaints is two questions: Who are you to order the structure of image or sound or voice of the interaction of a soul and spirit at point of contact? What are you projecting onto what is in front of you? The poems within “She of the Dreaming Sky” took time to unwrap. I selected it from the bookstore shelf because it was the first woman-authored poetry collection I pulled from the shelf. First read-through I was disappointed. The poems felt cliché and, as someone who has over the years hung out with Tai Chi practitioners and aging hippies, tired. Then, I would read a line or phrase whose clarity stunned me. Reading the poems in “She of the Dreaming Sky” is like watching an autumn cloudy sky being cleared of gray clouds by a brisk north wind. The clouds are moving, going somewhere, and a patch of painfully blue sky appears above you. The brilliant blue sky is there existing behind the clouds all the time. You as reader must have patience to wait for the clouds to clear. One after another the poems became clear – or I became clear – with the passage of time. The book comes with a compact disc sound recording of eight poems from “She of the Dreaming Sky” read with music in the background. This is a good multi-media presentation of the work. Artwork throughout the collection is by Randall. It all looks and sounds good. 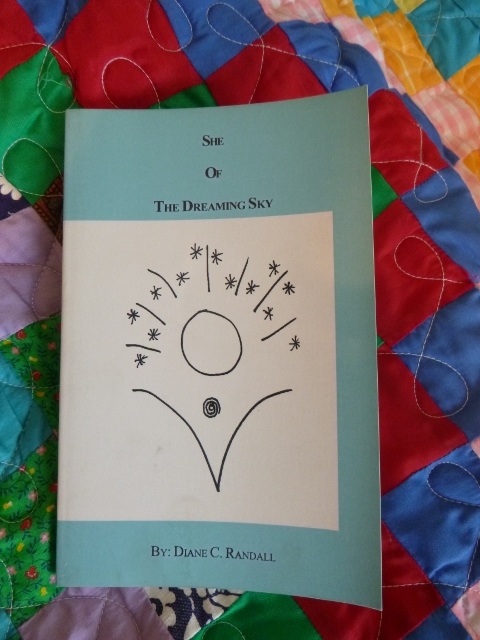 “She of the Dreaming Sky” made me cognizant of what I project onto the world. I had to work for that realization, and to appreciate the quality of these poems. This collection contains many more good to excellent poems than okay to “meh” poems that you see in other collections identifying themselves as “spiritual poetry”. It is easy for “spiritual poetry” to be cloyingly grocery store cake frosting sweet, extremely earnest, and downright icky in my opinion. Randall avoids those pitfalls by crafting her poems to get to as close as she can to that point of contact between the subconscious and that part of her that devises words. I have not located a website for either Diane C. Randall or her publisher Pearl’s Book ‘em Publisher. “She of the Dreaming Sky” is available on online and through your favorite local bookstore or library.